Despite the name this species is actually a sedge. The unremarkable flowers turn into the bristle like cottony seed heads in June/July, creating a beautiful effect across a wet grassland of many waving cotton heads. This pappus, like dandelions, aids wind dispersal of the seeds. It can tolerate very acidic soils and inundation with water which is why it does so well in the peat rich areas of NPT. 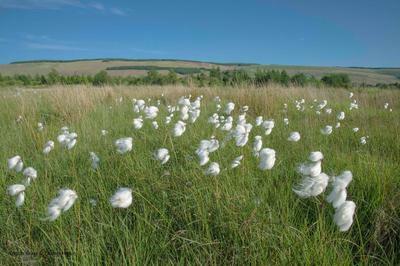 For more information see The Wildlife Trusts page on Cotton grass.